rocky's bru: "Unbecoming and irresponsible"
I'm taking my hats off to the Ministry of Foreign Affairs, Singapore for the open rebuke. I believe that Letter to the Editor convinced the TNP editor to issue his statement of remorse and thus helped end a Malaysia-Singapore tiff before it had a chance to take ugly shape. Kudos also to our Foreign Minister Anifah Aman and Menteri Besar Khaled Nordin for registering Malaysia and Johor's displeasure with TNP's conduct. 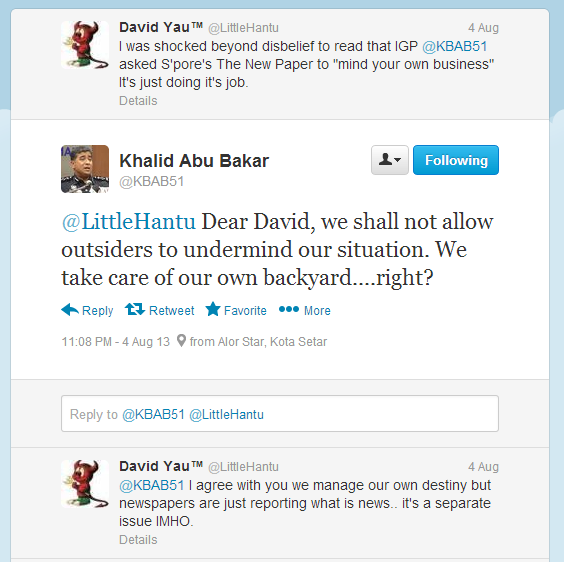 And, especially, to our IGP who had told TNP to "mind your own business". 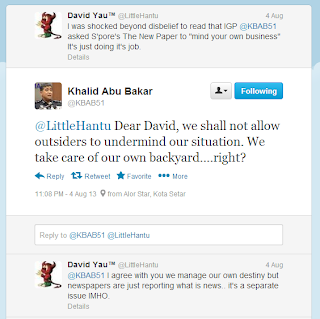 There were Malaysians who saw nothing wrong with TNP's article (which its own government views as "unbecoming and irresponsible"); until late last night the IGP was on Twitter trying to "convert" such people. Good Job Done IGP, But Please Be Consistent With Your Stern Comment And Actions, Be It Today Or Tomorrow And So Forth! When will our home minister have the balls to tell off our own rogue newspapers? Kick a fuss and we can gloat our success to get Singapore ministry to tone down TNP, we can do all the spin doctoring, but if fundamental problem of gun crime and high petty crime is not solved, then we are wasting our time. point to the right problem if you must to write. so still no apology from the editor? or we should expect Kuan Yew style apology? and ah. minister, u shud speak to kuan yew as well about the things he spoke about JB. another thing. 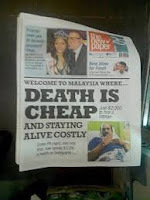 very silent respond from malaysia malaysians people? DAP First Malaysia Second? Staying alive to Makan-Minum pun jugak costly... Restorens pun kena hire armed guards to ward off robbers in Klang Valley, plenty kes goes unreported!!! There is a long-standing somewhat sick joke among Singaporean Chinese that goes: "If you no money then better don't die first ah, because the priest chanting and burial rites nowadays so expensive oi?" Also, "having a life" is too costly in Singapore as everyone with the experience knows by now. How about Utusan Malaysia's reportings which are irresponsible and unprofessional and harping on racial issues which always blaming the non-malays? Can any of our govt officials(minister or police) help to tell him off? Put a leash on Utusan editors lah, then only preach about "Unbecomingness and irresponsibility""!!! Doesn't really matter whether Singapore apologized or not. The harsh reality is that what was published bothered on some naked truth. As usual, UMNO is in denial and Rocky is wagging his tail happily as long as he is well-fed from his political master. Put a leash on Utusan editors? Come on Bodohweewee, we have Press freedom here in Malaysia not like your cousins in Singapore. In Malaysia also the Opposition gets to sue the newspapers and journalists. In Singapore, FYI, only the Government gets to sue the media and win. "Malaysia losing talent to keep one race dominant: LKY" (http:sg.news.yahoo.com/Malaysia-losing-talent-to-keep-one-race-dominant-lky-072329450.html). Can we expect Anifah Aman and Wisma Putra to make another complaint about what LKY wrote in his latest book? Or expect outrage and a stinging editorial from Awang Selamat and much online vitriol from certain members of the bloggerati? Incidentally, didn't Tun Daim make some nice comments recently about LKY? Those were reported in the Singapore Straits Times. I wonder if they saw the light of day in the NST or The Star. Yes, we are so firm and quick to condemn Spore for one bad headline(one time only) but when utusan made many bad headlines bashing a certain minority race, not a word from the authorities including you Datuk.Why? Read the fine print and between the lines. TNP has not cut down on it's reporting of crime in Malaysia, including the latest shooting sprees. What it has done is to do away with sensationalist headlines. The substance of the reports remain unchanged and are based on facts. There's nothing much Wisma Putra can do about the reporting of facts by the foreign media. Especially if the facts are in the public domain. So, maybe, A Kadir Jasin was on to something when he wrote his piece. It looks as if he wrongfooted you, Bru. With the compulsory licensing of newspapers? Puhleese, you can do better than that, surely? Incidentally, did you read about the Rupert Murdoch-controlled papers in Australia are unloading on Kevin Rudd and the Labour government? And Rudd says that it's perfectly ok, as they are free to write what they want and opine as they wish. Do you see the same thing happening in Malaysia, eh? What about the Star? Can ask them to be more fair in their reporting and not racially biased? Baling batu and sembunyi tangan type. Don't believe ask Helen Ang lah! Why talk only about Utusan? Stupid alien!